Do you want a Kindle DRM Removal software or tool? This article includes helpful information and the best programs to use for removing DRM copy protection from your Kindle Books. Digital Restrictions Management is the practice of imposing technological restrictions that control what users can do with digital media. When a program is designed to prevent you from copying or sharing a song, reading an ebook on another device, or playing a single-player game without an Internet connection, you are being restricted by DRM. In other words, DRM creates a damaged good; it prevents you from doing what would be possible without it. This concentrates control over production and distribution of media, giving DRM peddlers the power to carry out massive digital book burnings and conduct large scale surveillance over people’s media viewing habits. 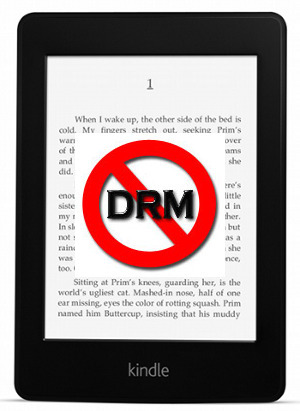 Like most media formats of today, Kindle Books are loaded with Digital Rights Management (DRM) schemes. The DRM schemes are put in place by the publishers as a safeguard against piracy and to control how the readers use the book they’ve purchased. This means you can read this book on your Kindle, but not on another device. The following Kindle DRM removal tutorial shows how to use free Calibre e-Book software to remove the Digital Rights Management (DRM) from books you have purchased so that you can move them to other e-Readers. For example, if you have a Kindle e-Book and wish to put it on your Nook, transfer it to your computer, import into Calibre with these plugins, and then you can copy it to your Nook. As for preventing piracy, DRM’s value in doing so is dubious at best; why would anyone go to the hassle of stripping DRM if they intended to pirate the material anyway (as DRM-free pirated copies of just about everything already exist all over the Internet). In other words, DRM poses a fairly large inconvenience to the paying customers and no inconvenience at all to the pirates. With that in mind, read on this post to see how you can be an upstanding citizen that supports the people who create the content you love, but with the freedom to enjoy that content on your devices as you see fit. You’ll absolutely need Calibre and Apprentice Alf’s excellent DRM-stripping plugins. The Kindle for PC application is entirely optional, but it does make it way easier to get to all your Kindle books at one time instead of manually transferring/downloading each book one by one. Note: The tutorial mentioned above will only help you strip the DRM from books you have actually purchased. The tools used herein will not work to strip the DRM from library ebooks, loaned ebooks, or other ebooks of which you are not the original purchaser. You just learned how to remove DRM from Kindle. And now the next thing you need to do is apply what you’ve learned so that you can start DRM-free reading.